The Kiko's like to tell us about their "victory" in Japan, but they'll never tell you about their absolute defeat in the Archdiocese of Lingayen-Dagupan, Philippines. A brief review of what happened in Japan is necessary to understand why a supposed "defeat" for the bishops in Japan was an occasion of victory for the Archbishop of Lingayen-Dagupan. PIUS: What happened was very simple, okay. The bishops of Japan which are very very territorial. They saw that the neocatechumenal way - they judged it as being too European. Therefore they decided to stop it. PIUS: They decided to stop it And in Japan it is very important that they look united. They are not united. But they look united. There were some bishops who were against this. They didn’t like the Way, they weren’t in favor of the Way. Therefore, however, for the sake of appearing united, of looking as united front. PIUS: They decided to take this decision. For five years the brothers cannot meet in the church. No one can prohibit anyone. They Church cannot prohibit anyone from meeting. I can meet in the homes. I can go and study scriptures in the homes. This is a right of every Christian. No one can take away this right. Therefore, the brothers continue, but they are meeting in the homes. They cannot have a Eucharist because a Eucharist is a liturgy therefore they cannot because the bishops do not want. Therefore for five years they were put on quarantine. You cannot meet. You cannot have a celebration in the church. PIUS: This as you can imagine created a predicament, the suffering. But the brothers did what they were told. They obeyed. They didn’t make any protest. They didn’t go to the FBI. They just obeyed. They just did what they were told. And Kiko went to visit them. What he’s saying is this. They basically disobeyed the pope. It’s a very serious thing. Because the pope told them explicitly, Pope Benedict, don’t do it, don’t do it. And they decided to do it. It is very clear disobedience. But they have their conscience and they see the front of God. But for you to know the facts. The problem that the Japanese bishops ran into was their trying to approach the matter as a national bishops conference. National conferences do not carry any authority over individual bishops and their dioceses. So the conference could not have enforced a national decision. Pope Benedict simply reminded the Japanese bishops of this which is why Bishop Mizoe wrote "it is the Bishop who must settle it." Pius and his kiko nuts twist the Japan situation to make it a victory for the neocats, and their mind-numbed robots simply lap it up. As you can see, the facts are otherwise. A year earlier, an Archbishop in the Philippines did it right, and it is worth taking a look at his full address on the matter which is copied here. As you will see, the archbishop continues to reference the absolute authority he has to govern the NCW in his diocese. The seeds of the NEOCATECHUMENAL WAY were first sown in the Archdiocese of Lingayen-Dagupan in 1981 in the Parish of Saint Gabriel the Archangel in Bonuan Boquig. Since then, it has been born in other Catholic communities in the archdiocese – Bonuan Gueset, Calasiao, Calmay, Dagupan, Laoac, Lingayen, Mapandan Santa Barbara and San Jacinto. The Neocatechumenal Way has brought innumerable blessings to the Christian faithful in our archdiocese. It has profoundly changed many lukewarm lives. It has rebuilt many wounded families and has yielded many religious and priestly vocations for the vineyard of the Lord. 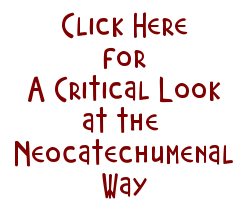 Yet, despite its positive effects such as those mentioned above, there are certain concerns about the direction the Neocatechumenate is leading to. Already during the time of my esteemed predecessor Archbishop Oscar Cruz, and in recent months, some questions have been raised by some respected members of the Catholic laity and a good number of our parish priests about the integration of the members of the Neocatechumenal communities in the mainstream of our Church life, their cooperation with the parish priests and their relationship with the Bishop. In the weekly celebration of the Word prescribed by Article 11 of the Statutes, my attention was called to the lack of formation and preparation on the part of those entrusted to teach regarding the tenets of the Catholic Church as laid down in its Catechism as well as the meaning of the biblical readings proclaimed within the celebration. There seems to be a tendency towards fundamentalist interpretation of the Sacred Scriptures detached and, sometimes, even contrary to the documents of the Magisterium and the Catechism of the Church. There is a prevailing sentiment of superiority among the community members on account of sheer membership in a Neocatechumenal community resulting in a disdainful attitude towards those who are not walking the Way or have stopped joining the meetings. Besides, disdainful and disrespectful remarks about my predecessor, about some priests and even about my own person, have been repeatedly heard from the catechists of the communities contrary to good manners, upright conduct, filial respect and Christian charity. The President of the Pontifical Council for the Laity offered three guidelines for the Neocatechumenal communities when he presented the Holy See’s approval of the movement: obedience to bishops, acknowledgement of the role of priests and fidelity to the liturgical texts of the Church. On the same occasion, Carmen Hernandez, co-founder of the movement, said: "What is important is NOT the Neocatechumenal Way, but the CHURCH." She continued by inviting the members of the movement to practice humility. In January 2009, when the Neocatechumenal Way celebrated its fortieth year as a Catholic lay association, the Holy Father gave thanks to God for the fruits of the evangelical efforts of the Way. However, the Pope reminded them that the full realization of the work comes with docile adherence to the directives of the bishops and with communion with all the other components of the People of God. He encouraged them to work for unity --- which makes of each community a living and well integrated joint in the mystical body of Christ. THEREFORE, considering the foregoing facts and statutory principles, by virtue of my authority as Archbishop of Lingayen-Dagupan, in order to guide and reorient the Neocatechumenal Way in this archdiocese, I hereby impose a moratorium on all initial catecheses in the Neocatechumenal Way within the archdiocese until the Episcopal Delegate, named below, recommends the lifting of this moratorium. No new communities shall be opened and no new members may be initiated into the Neocatechumenal Way within the moratorium period starting on the Solemnity of Pentecost this year until the Solemnity of Pentecost in 2011. Likewise, I order the reading, within the whole year, starting from the Solemnity of Pentecost this year until the Solemnity of Pentecost in 2011, of paragraphs 748 to 945 of the Catechism of the Catholic Church, pertaining to ecclesiology, the readings being spread out during the weekly celebrations of the Word of each Neocatechumenal community. In addition, effective today, I revoke the canonical mandate previously granted by the Archbishop of Lingayen-Dagupan to the incumbent itinerant catechist to teach the Catholic faith within this ecclesiastical jurisdiction. To put into effect the above mentioned directives, I hereby appoint FATHER MARIO DOMINIC SANCHEZ as my Episcopal delegate for the Neocatechumenal communities in the Archdiocese of Lingayen-Dagupan. The Episcopal delegate is tasked with the following specific functions, namely: 1) to implement the strict observance of the directives contained in this communication with the faculty to impose canonical discipline in the name of the Archbishop when pastorally necessary; 2) to supervise all the convivences of the Neocatechumenal Way held in this ecclesiastical jurisdiction and to insure the regularity of confessions among its members in conformity with Article 14, n.1 of the Statutes; 3) to extend pastoral care and charity to the hurting members of the community who have stopped attending the meetings due to the scandalous conduct of the local leaders in the past and to render pastoral attention to the sick and elderly members who have been deemed unworthy to "walk the Way." The Episcopal Delegate is also hereby directed to see to it that the manner of questioning that takes place during the scrutiny of members is done in accordance with the approved discipline of the Church, respecting the right to privacy and that it is carried out within the bounds of Christian charity. Finally, I instruct him to look into the accounting and administration of the financial donations made by the members of the Catholic faithful to the community and make a report thereof to me every three months. I take this occasion to reaffirm my conviction that the Neocatechumenal Way, with its goal to bring people to fraternal communion and maturity of faith through the tripod of "Word of God-Liturgy-Community," is a gift of the Holy Spirit to the Church and society of our times. Like all gifts, the Neocatechumenal Way must be cared for and protected from the effects of original sin in us. It must be shielded against the pride and arrogance of its leaders. Those who walk the Way must never be found lacking in charity and deviating from the path of truth. Pastoral charity for the Catholic faithful who are members of this community moves me to take these steps to insure the stability of our faith and the purity of the teaching that the faithful are entitled to receive. Peace be with you all! Amen! From the Cathedral of St. John the Evangelist, Dagupan City, this 3rd day of May 2010. And, by the way, this is why Guam was and is so important to the Neocats. It was the only diocese in the world in which the neocats owned a bishop, and they still do. Well said, Tim. Here is a post I did in late 2014, a few months after the Beginning of the Year Convivence where Edwin Sammut told these lies. I looked at his words from a different perspective. One point was: What about "our" Fr. Santiago Flor Caravia, former pastor in Chalan Pago. If Sammut was right, then what the heck is Fr. Santiago doing in Japan. The Umatuna said we sent him there as a missionary, and as we all know, the Umatuna ALWAYS tells the truth. And is he incardinated here or there? tim, you said, "this is the only place where they owned a bishop, and they still do." Obviously, you are referring to apuron. But, now shouldn't it be in the plural sense, to include Hon? That's what I meant by "they still do." I have no doubt about the scandalous actions and practices of the Neos here on Guam. And I know we must fix the grvae matters regarding the seminaries and propert and wrongful treatment of certain priests and laity. And we must also discuss how we bring our Neo brothers and sisters back into the fold of our church. I believe this concern is as important as the others, but I haven't come across a post here or much discussion about it. I myself have several loved ones who walk in the way, and I see them as victims of Kiko, Pius and their brainwashing teachings who would have a hard time realizing the errors of the way. How do we lovingly and with Christian charity bring them back? How did the Archbishop in the PI do it? Have they succeeded? Is their church united? I thank you all for your posts on this blog. The greater public is just catching up to everything that has been posted here for years. Keep up the great work. Abp Villegas did not ban the way, he simply suspended any new groups from forming by "imposing a moratorium on all initial catechesis in the Neocatechumenal Way within the archdiocese until the Episcopal Delegate recommends the lifting of this moratorium. No new communities shall be opened and no new members may be initiated into the Neocatechumenal Way within the moratorium period starting on the Solemnity of Pentecost this year until the Solemnity of Pentecost in 2011". Where did you get the idea that Villegas "banned the way?" Neither I nor Villegas said anything about banning. The Japanese bishops only wanted to impose the same moratorium. 12:15. Trying to assist the neo's who want to leave the NCW has been a topic several times on this blog. In addition, I have, many times, noted that they are victims. Some have actually taken personal responsibility for their eternal fate and walked away despite the hardship which followed them. There are two subsequent letters in 2011 (see the links provided in one of the comments above). While Archbishop Villegas didn't ban the NCW from his archdiocese, he ultimately severely restricted the formation of new communities and basically said that, to the extent possible, they will have to blend in with the mainstream Catholic community as they walk The Way. They are not going to get special treatment. Read all three writings by Archbishop Villegas above (May 2010, June 2011, and Dec. 2011) and you’ll see the attempt at fairness by which he handled the growing conflict between the NCW and the mainstream Catholics in his Archdiocese. Yet, I couldn’t help but see the partiality he had for the mainstream Catholics. In his May 2010 letter, he imposed a one-year suspension on the activities of the NCW for two reasons (1) “… the lack of formation and preparation on the part of those entrusted to teach regarding the tenets of the Catholic Church as laid down in its Catechism as well as the meaning of the biblical readings proclaimed within the celebration, and (2) “ … a prevailing sentiment of superiority among the community members on account of sheer membership in a Neocatechumenal community resulting in a disdainful attitude towards those who are not walking the Way or have stopped joining the meetings.” These are the same bases for the complaints about the NCW on Guam. 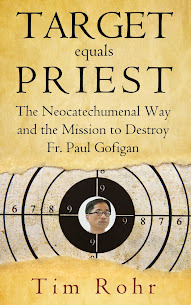 For a one year period, Archbishop Villegas (1) suspended the NCW’s phases of conversation, (2) no new NCW groups can be established in his Archdiocese, (3) NCW followers must read paragraphs 748 to 945 of the Catechism of the Catholic Church, pertaining to ecclesiology [because the teachings of the NCW differ from these doctrines of the CCC]; (4) the NCW has to pray the five mysteries of the Holy Rosary before their weekly celebration of the Word; (5) no NCW catechists can teach the Catholic faith in his archdiocese; (6) the NCW’s accounting and administration of the financial donations made by the members of the Catholic faithful to the NCW are going to be audited by the Archbishop’s office. He then designates Fr. Sanchez to keep an eye on the NCW for a year to make sure the NCW leadership and followers are taking the necessary steps to adhere to the Archbishop’s directives. And with compassion, one of the duties he imposed on Fr. Sanchez was to “extend pastoral care and charity to the hurting members of the [NCW] community who have stopped attending the meetings due to the scandalous conduct of the local leaders in the past and to render pastoral attention to the sick and elderly members who have been deemed unworthy to "walk the Way." On year later, in Archbishop Villegas’ June 2011 letter he outlines the improvements/progress made by the NCW as they relate to the directives he imposed upon them the year prior. Generally speaking, the Archbishop acknowledged their improvements but (1) reminded them that of the already heavy work load of parish priests, that the priests’ are to attend to all the faithful in their parish, not just to the NCW; (2) the suspension of the NCW’s special masses is lifted, masses may be celebrated again at the discretion of the schedule and workload of the parish priest. To this he allows their Saturday evening celebration of the mass to be only once a month, not weekly, and reminds them that there is no difference between the Mass in the parish and the Mass with special groups (he points out that the NCW hasn’t reached that understanding); (3) he lifts the suspension on all initial catecheses and the opening of new communities; (4) he makes them continue for one more year to pray the rosary prior to the celebration of the Word; (5) the NCW must be encouraged by the parish priests to join the other parish ministries, apostolates and associations, basically, blend the NCW members with the mainstream parish, and directs his pastors to insure the orthodoxy of doctrine that is transmitted to the members during the weekly celebrations of the Word and that the discipline and doctrine of the Church are faithfully adhered to (6) no new NCW communities may be opened without the approval of the parish priest and, (7) he gives the power to parish priests to determine the NCW’s worship schedule and even the power to suspend the NCW activities if those activities get in the way of normal parish activities and/or if the doctrine and discipline of the Church are undermined by the NCW activities. In Dec. 2011, Archbishop Villegas suspends the new formation of NCW communities for 2012. The Archdiocese will support the NCW members who are already walking the Way, but will not allow new communities to form. And directs that, at NCW masses, only duly commissioned EMHC (Extra Ordinary Ministers of Holy Communication) may assist in the distribution of Holy Communion. On May 2012 (see the comment below from Mary Lou), after consulting with the Episcopal Commission on Liturgy of the Catholic Bishops’ Conference of the Philippines, Archbishop Villegas (1) gives the okay for the NCW to continue the timing at the New Mass for the exchange of the sign of peace, (2) clamps down on the manner by which the NCW receives Holy Communion, (3) orders that the hosts & wine they use for a the New Mass must be the same types used by the rest of the Archdiocese, (4) that lay Catholics, not exclusively clergy, are allowed to preach in the church. Further, he reminds the NCW that they must strictly observe the General Instructions of the Roman Missal and of the Congregation for Divine Worship. The NCW celebration of the Eucharist is loosely modeled on the Novus Ordo Missae but contains elements that the NCW has added. Certain parts of the “New Mass” (this is the term the NCW calls its mass) have been either deleted or placed in a different location as practiced in the traditional mass. For example, the “Sign of Peace” in the New Mass is exchanged before the Presentation of Gifts (Offertory). In a traditional Catholic mass, the “Sign of Peace” is exchanged after the “Our Father” is prayed. Archbishop Villegas “okays” this out-of-order practice at the New Mass. With regard to Holy Communion, the distribution and reception of the Eucharist at the New Mass is at the pews (while seated). Basically, there are two rounds of distribution. First round, the priest and altar server go to each follower at their seat/pew and distribute the consecrated host. The host is received only by hand. Second round, the priest and altar server go to back to the pews again with the chalice and distributes the Precious Blood to each follower as they are seated. Archbishop Villegas orders the NCW that this practice has to stop. By comparison, at the traditional Catholic masses, those who receive Communion go up to the sanctuary to receive the Body and/or Blood while standing or, still in some parishes, while kneeling at the communion rail. Archbishop Villegas orders the NCW to receive communion as in the form practiced in the traditional Catholic mass. Again, while not banning the NCW’s presence in his Archdiocese and while acknowledging the good works they have done in his Archdiocese in the 20 years they have existed there, Archbishop Villegas’ letters are a reflection of his awareness of the problems that arose between traditional Catholics and those who practice the Way. Along with consultative bodies of the Church, he evaluated those problems and he set directives to address those problems. Then follows-up to check if his directives are followed and if improvements have taken effect. By comparison, Fr. Apuron appears to have been deaf and blind to the problems that have arisen over the years in his archdiocese between the traditional Catholics and the Catholics who follow the Way. NCW itinerants love for the ordinary members to take the blame while they themselves remain the blue-eyed boys of most of the hierarchies. We ought to research what the real Church enjoins on ordinary members of the NCW and exact no more than that. With regard to the questions that our parish priests have raised about the practices of the Neo Catechumenal Way in the celebration of the Eucharist, I have sought the assistance of the Episcopal Commission on Liturgy of the Catholic Bishops’ Conference of the Philippines. Enclosed with this circular is the position of the said Episcopal Commission regarding the matter. Please take note that the only permission granted to the Way is the transfer of the Rite of the Peace after the Prayer of the Faithful and the reception of Holy Communion under both species either kneeling down or standing up but not sitting down. Other than these two permissions, the Masses celebrated for the members of the Neo Catechumenal Way must strictly observe the General Instruction of the Roman Missal and the other instructions of the Congregation for Divine Worship. In particular, the hosts and wine to be used for the Eucharist must be the same as those used in the dioceses of the Philippines. The lay faithful may be allowed to preach in the church or in oratory outside the Mass (Redemptionis Sacramentum, 161). I entrust these clarifications to your kind information and faithful observance. Please be assured of my pastoral concern. I'm curious what the current status of the NCW is in that archdiocese. The priest go thru th epews distributing Our Lord's Body with no reverance at all. When the celebrant returns and offers up the Host and consumes it all in the pews do the same..sitting down. A disgrace. i'm not from pangasinan but my in-laws are, and i've had the privilege of visiting the diocese of lingayen-dagupan and attending a Mass celebrated by archbishop villegas at the cathedral there. he seems like a solid bishop and well versed in the teachings and current affairs of the Church, and knows what's within his authority. too bad guam didn't and doesn't have that. in every diocese, the complaints about the ncw are consistent. sadly, with a tainted congregation for the laity led by cardinal rylko, appeals to rome have fallen on deaf ears. furthermore, bishops have not had the same backbone as archbishop villegas does. hopefully the reorganized new congregation established by pope francis will change things for the better. i have no doubt, however, that the neocats are already hard at work infiltrating and compromising that new organization before it even gets off the ground.